An expendable Minotaur 4 rocket launches several satellites, including NASA's FastSat, from the Kodiak Launch Complex in Alaska on Nov. 19, 2010. KODIAK,Alaska -- Nestled on a barren bluff on the southern shore of KodiakIsland -Alaska's emerald isle - a state-owned launch complex is vying to drawspacebusiness to America's last frontier. TheKodiak Launch Complex hosted its first satellite launch in more thaneightyears Nov. 19, successfully sendinga Minotaur 4 rocket intoorbiton a $170 million mission with seven government anduniversity satellites. It'sup to Dale Nash, a former space shuttle engineer and operationsmanager, toshowcase the perksand benefits of Kodiak to the launch industry. Nashis chief executive officer of Alaska Aerospace Corp., a state-ownedcorporationtasked with luring space enterprises to one the least populated statesin theunion. Kodiakhas one of widest launch ranges in the world, supporting rocket flightsflyingto the southeast, south and southwest toward polar and otherhigh-inclinationorbits. Nash is working on deals with smallsatellite launch providers and companies with medium-liftrockets to take advantageof Kodiak's geographic fortune. "Froman orbital mechanics point of view, it's a great location," Nash said. "We have azimuths from 110 degrees to 220 degrees, a wide open azimuthtolaunch in." Thewide open Gulf of Alaska and the adjacent land-free slice of thePacific Oceanmean officials do not have to worry about overflights of populationcenters orprivate property, a key concern for rocket launches. Satelliteslaunched from Kodiak can reach inclinations from 60 degrees to morethan 100degrees, encompassing popular gravity-neutral, Molniya, tundra andsun-synchronous orbits. Kodiakis also outfitted to conduct back-to-back responsive suborbital orspacelaunches thanks to a state-of-the-art range and control infrastructure. AAC,established in 1991, owns and operates the Kodiak Launch Complex. Thecorporation employs about 50 people, about 30 of which work full timeatKodiak. Another contingent is based in Anchorage, home of AAC'scorporateheadquarters. Launchesfrom Kodiak began in 1998, and Friday's mission marked the 15th flightoriginating from the 3,700-acre facility. Besides space launches,Kodiak hasalso been the site of missile defense tests. Nashsaid the federal government has invested about $150 million in thecomplex,while the state of Alaska has provided approximately $25 million. TheMissile Defense Agency announced earlier this year plans to move targetmissilelaunches to Kwajalein Atoll in the Marshall Islands, leaving Kodiakwithout ananchor customer. 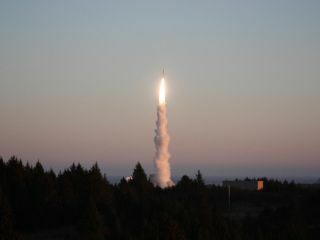 TheAir Force agreed to two Minotaur 4 rocket launches from Kodiak,including theNov. 19 flight. Rocket motors for another Minotaur 4 rocket are alreadyatKodiak for launch of the military's TacSat 4 payload in May, accordingto Lou Amorosi,the Orbital Sciences Corp. executive vice president for the Minotaurrocketprogram. Amorosisaid TacSat 4 is the only other Minotaur rocket mission currentlyscheduled tolaunch from Kodiak. TheMDA's contract with AAC provided sustaining funds to keep the launchcomplexoperating, but the Air Force deal includes a lesser daily utilizationpay rate.The state of Alaska may need to funnel more money into AAC to ensureKodiak'sfuture availability. "It'schallenging, but it's optimistic with the Air Force and the smalllaunches thatare coming through," Nash said. "I have asked for some sustainingbudget from the state as well as asked for backing to really goapproachOrbital or SpaceX to get them to be an anchor tenant." SpaceXis already planning to locate polar launches of its Falcon9 rocketat Vandenberg Air Force Base, Calif., but Nash said his companycontinues adialogue with the start-up firm. OrbitalSciences' Taurus 2 rocket, a medium-lift liquid-fueled launcher, is theothertarget customer for Kodiak's potential expansion into a larger class ofboosters. Orbital has not selected a West Coast launch site for theTaurus 2,but the company is considering Kodiak and two facilities at Vandenbergforpolar missions. Thestakes are high in the bid for Falcon 9 and Taurus 2 flights. "Ifyou win it, you win it for a generation," Nash said. "The unfortunatepart is if you lose it, you lose it for a generation and it might be 25moreyears before any more rockets come around." Anew launch pad built to handle liquid-fueled rockets will cost about$80million. Surveyors have already selected a site adjacent to Launch PadNo. 1,Kodiak's existing space launch facility tailored for solid rockets suchas theMinotaur, Athena and Taurus families. Anew solid motor storage facility was built at Kodiak to house MinotaurandAthena stages, supporting a backlog of missions if the manifest getsbusier.Lockheed Martin Corp. has identified Kodiak as the primary West Coastlaunchsite for the reincarnated light Athena 1 and 2 rockets, but the Athenadoes nothave any confirmed customers. Kodiak'sfirst orbital launch in 2001 was an Athena 1 rocket. "That wasthe rocket this facilitywas designedfor, but not the only one," Nash said. Polarsatellite launches of civil government Earth observation and weathermonitoringspacecraft are a key segment of the medium-lift rocket business. AGovernment Accountability Office report last week identified more thana dozenscience missions through 2020 awaiting rocket assignments. Many ofthosesatellites will likely be placed on Falcon 9 and Taurus 2 rocketslaunchingfrom Vandenberg or Kodiak. SpaceXand Orbital are already operating or developing launch pads at CapeCanaveral,Fla., and Wallops Island, Va., respectively. Working under agreementsandcontracts with NASA, the companies are launching early rocket testflights fromthose sites before starting commercial cargo resupply services to theInternationalSpace Station. TheGAO concluded the retirement of the venerable Delta 2 rocket, whichflies fromFlorida and California, could force delays and rising launch costs forEarthobservation missions as the new Falcon and Taurus vehicles are testedandreadied for commercial service. "Idon't think that market is going away," Nash said. "That's been ourworkhorse forever." Copyright 2010 SpaceflightNow.com,all rights reserved.